NOW Environmentally Safe Dry Cleaning! 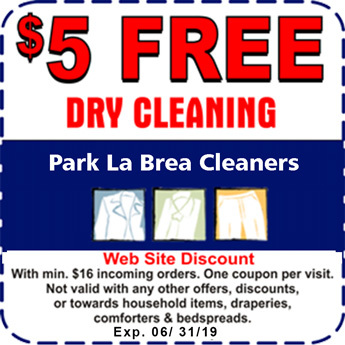 Park La Brea Dry Cleaners is a dry cleaners in Park La Brea, Los Angeles, that offers excellent dry cleaning, alterations, and laundry services. Our family-owned-and-operated service is open 7 days a week and offers a variety of cleaning specials. We feature Same Day Service and 2 hour Service as long as your dry clean garments are in by 11 a.m. We also offer wash and fold service for your convenience. 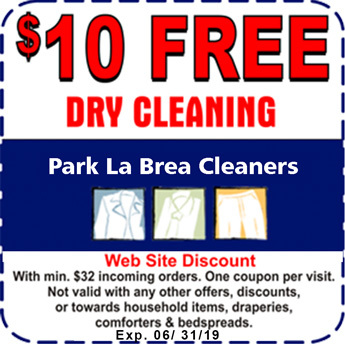 When you want the best in dry-cleaning service, contact us at Park La Brea Dry Cleaners. 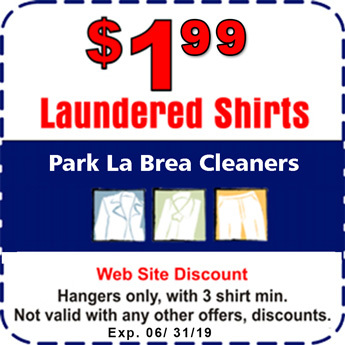 Whether you need wedding gown preservation or shirt service, Park La Brea Dry Cleaners can do the job. Our team of dry-cleaning technicians has the knowledge to get the job done right the first time and we work with all types of fabrics. We work one-on-one with you, and can answer any question you have. Come by today for all your dry-cleaning needs!